Los Angeles (April 10, 2018) – CJ 4DPLEX (www.cj4dx.com), the world’s leading 4D cinema company, announced today that the new monster-sized action adventure “Rampage” is coming to theaters in the 4DX and ScreenX formats. The film, headlined by action superstar Dwayne Johnson, will be released worldwide beginning April 13, 2018, from Warner Bros. Pictures. 4DX is the world’s leading 4D cinema technology, and ScreenX is the world’s first multi-projection theatre technology that allows for a 270-degree panoramic movie watching experience. 4DX eliminates the boundary between the audience and the film with motion chairs that move in perfect synchronicity with the movie being shown on-screen. The immersive theatre technology, launched by CJ 4DPLEX in 2009, uses in-theater effects to simulate wind, water, light, fog, scent and more to sweep the audience into the action on-screen. 4DX currently reaches 500 locations worldwide, with 10 of those locations in the United States. Created in 2012 by CJ CGV, part of CJ Group, ScreenX enhances the movie environment by allowing moviegoers to go beyond the frame of the traditional movie screen. It utilizes a proprietary system to expand images of feature films to the left and right walls of the theatre, creating an immersive, panoramic, and 270-degree experience. The technology has been installed in more than 140 auditoriums around the world, including three in the U.S., with more to come this year. In “Rampage,” Dwayne Johnson stars as primatologist Davis Okoye, a man who keeps people at a distance but shares an unshakable bond with George, the extraordinarily intelligent, incredibly rare albino silverback gorilla who has been in his care since he rescued the young orphan from poachers. But a rogue genetic experiment gone awry mutates this gentle ape into a raging creature of enormous size. To make matters worse, it’s soon discovered there are other similarly altered animals. As these newly created alpha predators tear across North America, destroying everything in their path, Okoye teams with discredited geneticist Kate Caldwell (Naomie Harris) to secure an antidote, fighting his way through an ever-changing battlefield, not only to halt a global catastrophe but to save the fearsome creature that was once his friend. In recent years, Warner Bros. Pictures has been consistently collaborating with CJ 4DPLEX to deliver the best experience for moviegoers in their two best formats 4DX and ScreenX. ScreenX is the world’s first multi-projection system used within a theatre setting. It was created in 2012 by CJ CGV, part of South Korean conglomerate CJ Group, as one of the “next cinema formats” along with 4DX, the multisensory cinema technology with motion and environmental effects. ScreenX allows moviegoers to go beyond the frame of the movie screen by utilizing a proprietary system that expands images of feature films and pre-show advertising to create an immersive, panoramic, 270-degree format that projects onto three theatre walls. To date, ScreenX has been installed on 138 screens around the world. CJ 4DPLEX is the world’s first 4D cinema company, headquartered in Seoul with international offices in Los Angeles and Beijing. The company created 4DX, the first and leading 4D cinema technology for feature films, providing moviegoers with an immersive cinematic experience that utilizes all five senses, allowing the audience to connect with movies through motion, vibration, water, wind, snow, lightning, scents, and other special effects that enhance the visuals on-screen. CJ 4DPLEX brings 4DX auditoriums to exhibition partners along with 4DX codes for both major Hollywood blockbusters and local titles. Each auditorium incorporates motion-based seating synchronized with more than 20 different effects and optimized by a team of skilled editors, maximizing the feeling of immersion within the movie, beyond the limits of audio and video. Since 2009, more than 480 Hollywood titles have been screened in 4DX. As of December 2017, more than 61,000 4DX seats operate in 500 auditoriums spanning 58 countries. CJ 4DPLEX was named a Most Innovative Company of 2017 in Live Events by Fast Company. For more information, please visit www.cj4dplex.com. 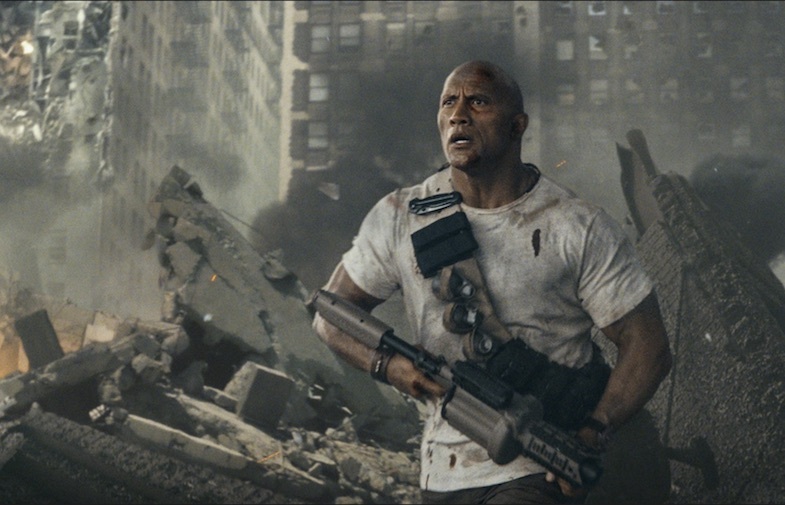 Global icon Dwayne Johnson stars in the action adventure “Rampage,” directed by Brad Peyton. The film also stars Oscar nominee Naomie Harris (“Moonlight”), Malin Akerman, Jake Lacy, Joe Manganiello and Jeffrey Dean Morgan; as well as P.J. Byrne, Marley Shelton, Breanne Hill, Jack Quaid, Matt Gerald, Jason Liles, and Will Yun Lee. Peyton directed Rampage from a screenplay by Ryan Engle and Carlton Cuse & Ryan J. Condal and Adam Sztykiel, story by Ryan Engle. The producers are Beau Flynn, John Rickard, Brad Peyton and Hiram Garcia, marking their third collaboration following the blockbusters “San Andreas” and “Journey 2: The Mysterious Island.” Executive producers are Marcus Viscidi, Dwayne Johnson, Dany Garcia, Jeff Fierson, Toby Emmerich, Richard Brener and Michael Disco. The Rampage creatures were brought to life by acclaimed VFX supervisor Colin Strause, with five-time Academy Award-winning visual effects company Weta Digital. A New Line Cinema presentation, in association with ASAP Entertainment, a Wrigley Pictures / F.P.C. / 7 Bucks Entertainment production, a Brad Peyton Film, “Rampage” will be distributed in 2D, 3D, 4D and in ScreenX in select theaters, and IMAX, by Warner Bros. Pictures, a Warner Bros. Entertainment Company. Tags: 4DX, CJ 4DPlex, ScreenX, Byung-Hwan Choi, "Rampage"